Bringing together fifteen essays by outstanding Buddhist scholars from Asia, Europe, and North America, this book offers a distinctive portrayal of the "life of Buddhism." The contributors focus on a number of religious practices across the Buddhist world, from Sri Lanka to New York, Japan to Tibet. The essays highlight not so much Buddhist doctrine or sacred texts, but rather the actual behavior and lived experience of Buddhist adherents. 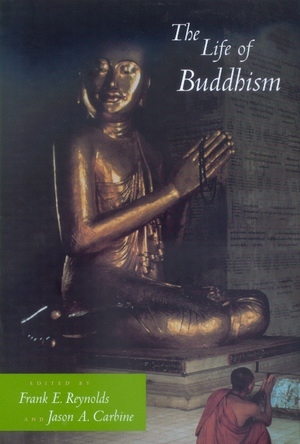 A general introduction by Frank E. Reynolds and Jason A. Carbine provides a historical overview and briefly characterizes the three major variants of Buddhist tradition—the Hinayana/Theravada branch practiced in Sri Lanka and much of Southeast Asia; the Mahayana branch located most notably in East Asia; and the Vajrayana/Esoteric branch established in Tibet and Japan. It also takes note of a distinctive form of Buddhism that is now emerging among non-Asian practitioners in the West. The editors introduce each essay with a brief commentary that situates its contents within the Buddhist tradition as a whole. The pieces offer concise depictions and analyses of particular aspects of Buddhist life, including temple architecture and iconography, the consecration of sacred objects, meditative practices, devotional expressions, exorcisms, and pilgrimage journeys. Topics discussed also include the construction of religio-political and religio-social hierarchies, gender roles, the management of asocial behavior, and confrontations with dying and death. Frank E. Reynolds is Professor of Buddhist Studies and History of Religions at the University of Chicago Divinity School. His many edited books include Myth and Philosophy (1990) and Religion and Practical Reason (1994). Jason A. Carbine specializes in Buddhist Studies within the History of Religions Program at the University of Chicago Divinity School. "Whereas traditional scholarship has focused on voices of elite groups, philosophies of different sects, and textual ideals, The Life of Buddhism presents a wide range of Buddhist practice in relatively contemporary contexts. The book represents a step forward by emphasizing the iconography, individualized and communal rituals, in addition to diverse practices and devotional expressions of both monastic and lay communities, and will make a significant contribution to the field of both religious studies and Buddhist studies. "—Bernard Faure, author of The Red Thread: Buddhist Approaches to Sexuality, The Rhetoric of Immediacy: A Cultural Critique of Chan/Zen Buddhism, and Visions of Power: Imagining Medieval Japanese Buddhism.